Waiting area at Garrity Chiropractic. 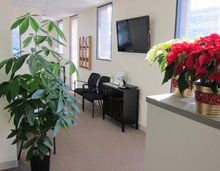 On your first visit to our office you will be greeted at the front desk by our friendly staff. After you’re settled in with a drink and a snack, we will ask you to answer some questions about your general health and any problems you may be experiencing. Dr. Garrity will then do an exam, review the results and treat you, all on this first day. If you have x-rays, MRI films or any other tests relevant to the problems you are experiencing, feel free to bring them with you. You can plan to spend approximately 45 minutes at our office for this first visit. At subsequent visits, you will have a treatment plan already in place, so your time at the office should be only 10-15 minutes on average. So, check us out here. Poke around. Get to know us. Then, contact our Danvers office at (978) 774-5475 to make an appointment so we can get to know you.